Image Courtesy of Flickr user Tassike.ee – Marju Randmer. Place all ingredients into a blender or food processor and process until smooth and creamy. Your blender may get “stuck” with the thickness of the ingredients. Simply turn OFF the blender and scrape the sides down to the blades with a wooden spoon. Adding more olive oil or bean liquid can help. 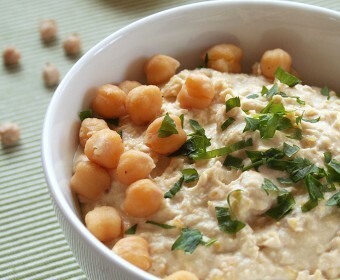 You will want to taste the hummus to see if it needs more lemon, tahini, garlic or salt. In a pinch I have substituted 1/4 cup natural peanut butter for 1/4 cup tahini. You can also add basil or other ingredients (such as red chili flake or roasted red pepper) to vary the flavor. Hummus makes a great, healthy snack and freezes well!